After surviving on Piloria once, Storm and Lincoln are the obvious candidates to return to the dinosaur continent to test the new virus that should clear the way for human settlement. But they have their own priorities - finding a cure for the plague that's sweeping Earthasia, an... read full description below. After surviving on Piloria once, Storm and Lincoln are the obvious candidates to return to the dinosaur continent to test the new virus that should clear the way for human settlement. But they have their own priorities - finding a cure for the plague that's sweeping Earthasia, and keeping themselves alive. S.M. Wilson lives on the west coast of Scotland. 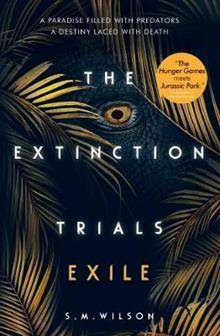 THE EXTINCTION TRIALS is her first teen series, written for her two children.